This article promotes six different herbs which act as air purifiers and in that way they improve our living conditions, and enhance our health. 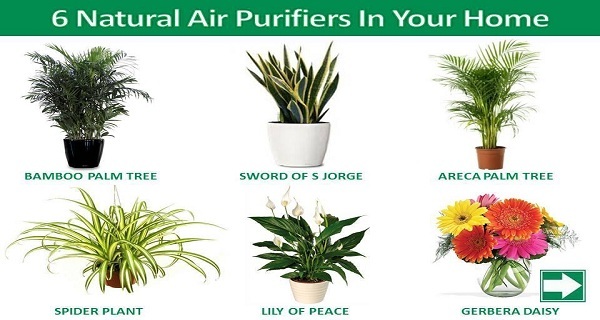 Whenever possible, put some of these plants in your home and naturally clean the air inside. Gerbera Daisy: These favorable flowers can absorb carbon dioxide and release more oxygen allowing a good night sleep. Moreover, they offer great effects in removing benzene from the air. Areca Palm: This plant is very often used for general air cleanliness, since it is undoubtedly one of the most powerful natural air purifiers. Spider Plant: Spider plants are one of the three best plants which can remove formaldehyde from the air, according to NASA. Spider plants will eliminate carbon monoxide and other toxins and impurities from the air. Bamboo Palm: According to NASA, bamboo palm can remove formaldehyde and acts as a natural humidifier. Peace Lily: This extremely beneficial herb is also called a clean-all, it has the ability to remove mold spores and because of those properties, it is regularly placed in bathrooms or laundry rooms. In addition, it is also capable of removing formaldehyde and trichloroethylene as well. Snake Plant: This air purifier, as found by NASA, absorbs and eliminates nitrogen oxides and formaldehyde from the air.